I have a long, rectangular lounge. Recently, I removed a bar area I inherited when I bought the house and it is a huge improvement. I've also just repainted the whole lounge to a lovely neutral white colour called Blanc (Resene, NZ). I now want to turn this newly updated space into a lovely, well laid out but comfortable lounge and dining area. I've lived in the home for 18 months and have not been able to figure out how to make the rectangle shape seem less like a bowling alley and more like separate areas in a big space. 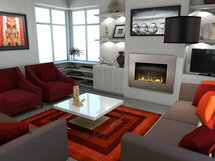 My vision (when I can afford it) is to also add a gas fireplace to one of the walls to make it feel more cosy. The house, even though well insulated, can be quite cold in winter, so I love the thought of a gas fireplace where we can sit around and play games or have a glass of wine. Ikea (but we don't have one in NZ). I travel a lot so have some unique art pieces I am also trying to showcase. While biggish, it is long and narrow and awkwardly shaped. I have been here for 18 months and still have not figured out a good way to lay it out. The space also needs to support my dining table but I don't know where to put it in the room. It feels big and open; I want different spaces in it to feel more warm and cosy. I also want to build in a gas fireplace. My dining room table...likely wasn't a smart purchase. It now feel ill fit for the room, but was almost too expensive to sell! I've taken a leaf out of it so now smaller and moved it to the diagonal wall, but it still just doesn;t feel like it fits the space. Dining room table (white) for now; open to keeping my yellow chair, but getting it recovered; I want to keep my globe light fixture. And, I've just bought the couch (used) so ideally, would like to keep it, but can sell if required. As for art, see pics. And note, I am happy to paint frames to white, etc to change the feel of the art. My old house had all wood floors, so the wood frames were a good fit, but not in the new place. 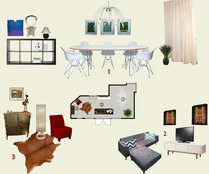 I like the eclectic style, but have no idea how to create it, so have chosen contemporary. I love big art, funky sculpture, bright colours - I just don't know how to make it happen. I wont likely be able to source many of the same materials being in New Zealand versus being in the USA. I am ok with that - and I can try to find designs here in NZ and when I travel that mimic what you recommend. We play a lot of games as a family (my 12 year old son and I) often we sit on the floor to do things. WOuld be nice to find a way in the living room to play games comfortably. Same with reading - aside from sitting on the couch, no real reading nook. 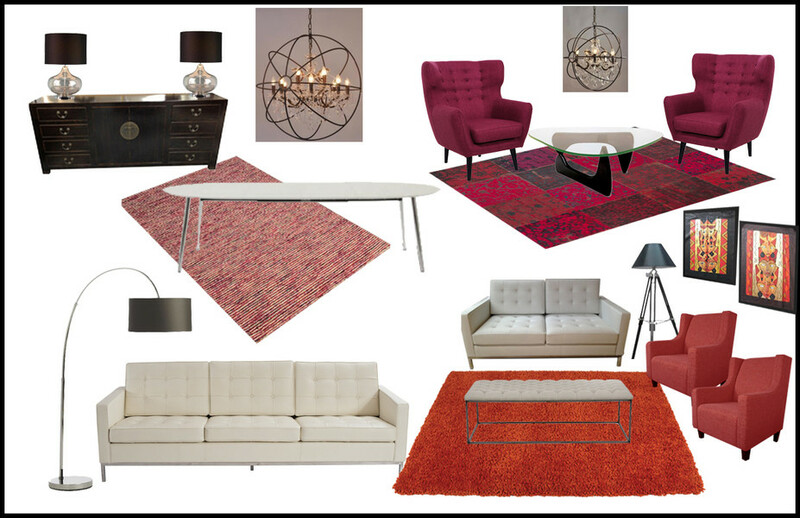 The original rugs we liked have sold out, so here is my final shortlist based on what I can get right now. I’ve also found a chair for the wine area that fits within the budget and has a couple of colour options that will work I would love you thoughts on this! That is a bummer about those rugs being sold out but I think you have put together a good selection here. I like that you went with the tigerlily, it looked great in your picture. I like the new choice for the lounge. For the wine area, unless you really like it, I am wondering if it might almost be too loud? You have a variety of art and if you put those hawaiian framed artworks over there like in the renderings then I think it would be too much all together. The pdf is a bit blurry for me so hopefully I will get these names pretty close....what I think you should go with for the wine area are either.... the abstract modern ziegle, the pad modern (its striped in middle of the page) or one of the classic tri-color options long or round. I would also go with the deeper red chairs. I would be happy to answer more if future things come up. Also, if you ever have any after pictures of the set up I would love to see them! :) Hope the shopping has been going smoothly otherwise! I hope everything in the package makes sense! Let me know if you have any other questions. Also, I just saw the email forwarded to me with the tigerlily rug. Looks great. I love the pop under the white table. Again, if you have more questions I would be happy to answer. It has been a pleasure working with you. Thank you, and safe travels on your trip! For the lounge I do not see the rug available anymore that we chose. So either from your latest collection choose your favorite (because they all went well together). I would go the largest size available in the preferred rug. So it will be larger than the rugs in the wine/dining area. The afghan one is my favorite of these three. Here are 3 I thought you might like. Hi: I've got to quit looking at rugs. Problem is, the stock seems to change. If you can, take a look at current cut/paste. Do I have my eye right? I am worried about wine rug if I go to that tigerlilly in dining area. But, I also don't want to spend a fortune either....so I like tigerlilly in the dining as good value. I can't find the lounge square rug at the moment....which is making me nervous. These groupings look great! I like the first grouping the most I think. There was a striped rug under the wine set that I liked a a lot. I added it to grouping 3 in your doc. Check it out. But altogether I like these sets! And I was also looking for the lounge square rug and could not find it again, so I am wondering if it is not available anymore? In that case I think choosing from the list you just made will work perfectly, if you see one you like just as much. Hi Rachel: Some good rug sales on! 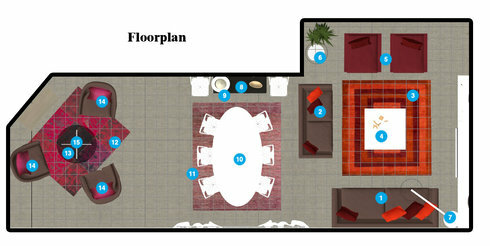 Are you able to give me the dimensions of the rug for the wine and lounge area? I know dining is 160 x 230, correct? I may go rug shopping tomorrow as the sales end before I get home. The rug in the wine area is 200x280 cm. You should be receiving the final package here soon once Decorilla approves it. I completely understand the new color scheme was probably overwhelming. For this package I went back to referencing the renderings you originally approved of...with exception to what we have discussed. I believe once you approve of the final package we can still go back and forth on here if you have questions later on. *Note* the rug I used in the final moodboard is different from the rendering. I was looking on the site and I could not find that striped rug anymore, so I am curious if they are sold out of it now? You might have better luck finding it if you liked it. I used the new tigerlily shag rug in the moodboard to show you how it would look. The shopping list will guide you to everything. I am happy to continue going over things even after we conclude the package. It has been great working with you and I am excited for you to start putting everything together. It is going to be a great space for you and your son! Got your message. A bit overwhelmed by the new colour scheme! I really love the original scheme, so am going to not shop online until I get back and then see what is available in lounge suites/chairs. I am in no real hurry. I know you've invested heaps of time, so happy for you to conclude. I don't know if you are able to do me a simple schematic with the new colours? I just cant see more of the raspberry or pink, so think I will stick with the the one with the burgundy chairs. Goes better with the S Africa art. You've been more than helpful, so happy for you to tell me what we need to do to finish off. Okay, with everything we have I put together a document file for you of what I think you should go with. These groupings go more maroon then red now but i think with everything in this file the whole space will look consistent and great together. Here are my thoughts on rugs as of right now. While I like all the patterned ones we previously thought about I am thinking minds change over time and with the groupings in this file you are about to see, these ones will stay in style in my mind and go with probably anything you choose for the space. Lounge.... the only things in this document that I think are not from the stores in NZ for you to actually get is the tufted coffeetable and the arching lamp for over the sofa, both from westelm in the lounge, which we could find one similar or maybe while you are over here (depending on assembly packaging maybe you could buy it while you are over here in the USA if you like it enough. I looked at the 2 rugs you saw and liked. I actually really like the shag one for the lounge if you like it. But I also showed the red one in the grouping just in case. I think for the prices you should go with those 2/3 seater tufted sofas in the cream leather. It would help keep your space still pretty light (not heavy looking). I think you should buy those two cheap chairs that the owner said were more "raspberry" colored. (It will bring in the color from the wine area) And if you go with the cream sofas then I think you should go with the "bark" color shag rug from nood. And then if you want more color then you can find colorful fun pillows for all the seating. Dining......Kingsbury Cabinet from JS Interiors. Lamps from Paulas.co.nz 2 Table Lamps on either end of it. Chandelier hung above dining table. Make sure it is hung where you can either have the dining table running horizontal or vertically. I am not sure what you are willing to spend for a buffet but I LOVED this one from JS interiors that is shown in my file. And I think it will look great with all the modern pieces yet. Wither keeping with the current lamp you have or going with these table lamps for on the buffet would look very elegant in my opinion. And the chandelier is elegant yet somewhat modern and would not block the view. Wine.... I showed my two top picks for the wine seating. Probably a different color (possibly a leather bringing in that "bark" color from the rug in the lounge?) Or the maroon chair from hunter furniture. I agree on having a taller back and arms, much more comfortable for sitting in. I definitely agree staying away from the tub chair is a good idea now. (Especially if you tried it out and did not like it) I really love this rug from for the wine space from signature rugs. I think it is beautiful and feminine and a perfect fit for the space. There is also a smaller version of the chandelier I show used for above the dining table that I think would look great to hang in middle of the wine space. I am writing a lot here but I hope everything makes sense. It is a lot to take in because there are quite a few great pieces we have found. I hope you like the new groupings I made. I feel pretty strong about this grouping, but you are the ultimate decider! And I am looking forward to your feedback. I grouped everything by room. :) I know you mentioned traveling to Vietnam and maybe its possible we could finish before Thursday but I know its coming up soon! Okay: Here is the list of furniture compiled so far. I am off on Thursday to Vietnam with my son - so I will have to stop looking for two weeks. There are some items on sale - so if you feel strongly there is something in my doc that is 'perfect', then let me know and i can try to action. At the very end are the trademe items for auction. Those two pink chairs are intriguing. She says the colour is more raspberry - not pink. I am keen to go for them if you think the style can work in the lounge. I would cap my spend at $600 and if the auction goes beyond...oh well! Hi Rachel: Thanks for your detailed mail with the pieces you like from the various sites. I am compiling a word doc with the stores/items so i can keep my head straight. I've had a look through the Freedom Furniture site. Can you give me your thoughts on the following? Also, I sat in a couple of tub chairs today. Not very comfortable as they don't come up high enough on the back. My preference to go for something more like you originally had - more an armchair. The Bronte from the Kiwibed company site below could be good. www.freedomfurniture.co.nz. They have quite good value lounge suites. 3. Bianca Button Style couch - without the piping. Prices are reasonable for new, custom made furniture. I went out furniture/rugs shopping today. Some good sales on at the moment. I think I need to start with the rugs. Then I can build from there. Would that make sense? http://www.nood.co.nz/living-room/rugs/pelludo-rug.html. Tigerlily colour. Comes in two sizes: 160cm x 230cm $249.50 and 190cm x 280 cm $349.50. For the price, they seem good value. The Roma was probably the better coloured of the two and was a flatter rug. The Pelludo is more a shag. Here is all my feedback looking at all the furniture stores you suggested to me. For the wine area I really think the lounge chair from Hunter Furniture would look the best. What do you think? Go to lounge->Domani -> Knox 3/2.5 seaters in a brown leather. 2.Rococo Chandeliers for possibility over dining table area/wine area if you decide you would like some pendent lighting. I just noticed the email crossover too! haha glad we both agree on it! They could certainly work in either the lounge or wine area. The lounge area has more of a red tone to it (as of right now) so I am thinking maybe that chair from Hunter Furniture would look the best in your wine space? It is more feminine looking and I think 3 of those would look great in that space, especially with the rug that is there. Or maybe it comes in a different fabric where it could work in the lounge area as well? On the lounge suite from trademe that you last posted.... I think the legs/structure of the sofa and lounge seat are exactly what we were going for. It looks, from the pictures, that the cushions need some major TLC and fluffing. So if you are up for that I think it would be a great set, and if that price is correct it would be an amazing price for a fixer upper and possibly even get the whole thing recovered if its within budget! Any merit in this lounge suite? This is an online cheap n cheerful chinese import furniture place. Any merit in this type of glass coffee table for lounge? AN idea: I am in the USA in October. I am traveling back business class so if we found a coffee table that we loved that could be packed up and be under 23kg, I could bring it back with me. PS: Where are you based? USA? Lisa, Yes I am based in the USA. For commercial shops, Hunter Furniture: www.furniture.co.nz always has nice things. Also, just saw online kiwi bed and sofas: www.kiwibedandsofas.co.nz - more chairs that could be custom made. Also, I do not know if you were still possibly interested in them but these are the original wine area chairs I had chosen for your space. They are from a store you recommended to us I believe. They could still work in the space, but I know you wanted more neutralized. But just incase here is the chair! These also look very comfortable to me to sit back and enjoy a glass of wine in and I loved the color. Hi Rachel: Thanks for trademe link. Have asked them a question re colour as can be deceiving. I did see these chairs and was going to recommend them for the lounge but I thought mixed with the brown sofas it would be way too much brown. But they would work for the wine space. It is just two so are you thinking you would be good with 2? Or maybe mix them with another pair of chairs? Here is a tufted coffeetable from westelm that I love and if we found one close to this I think it would look great in the space.. I think staying with a square (or round) coffee table would be best for the lounge. At least with how the measurements came out for me. And the rug in there that you liked has a great pattern to it and I would not want to hide it too much. If you do see a rectangular coffeetable either simple or tufted I would recommend moving the long sofa you get to where your current sofa is. Then having the coffeetable align with it. Then keep the seats where they are and move the loveseat to where the sofa is in the rendering. That could also offer up the possibility of moving the arching lamp to the back corner again. We don't get to the shopping list portion until we pass through the rendering phase but looking at tradeMe.co.nz here are two chairs I just found on there that could work for the space. The color I am not sure, but maybe you could get them recovered? http://www.trademe.co.nz/home-living/lounge-dining-hall/chairs/armchairs/auction-747038259.htm Just saw the pair and though it might be a good price as well. Also, check out the new screenshot I took of the space. I wanted to show you the sofas/wine chairs in a chocolate brown..I think this color looks great in the space, I especially love how it goes with the colors in the wine space. What do you think? Should I go forward with the chocolate brown for both space? I am happy to hear you are loving where the design is going! Is the metal cabinet you have a more gray color? From the pictures it looked more metalic goldish color on my computer and that's what I have used in the space. I do need to make the doors/hinges on it more like yours. What is the height of it? That will help make it look more realistic in the rendering. Yes, all the carpets used are from the NZ websites, and all three were from the pdf you sent over to me which you expressed liking. A few notes about these images. 1. IN the lounge area, I am wondering what you would like to see displayed on the shelves? Are there any decor items you would like me to put on them or maybe I should just find some books/vases to display there? 2. I have most of the frames for artwork to be painted black or a dark color to tie in the black from your kitchen. The frames above the buffet by the dining table that you see in the second image will be housing all your smaller prints (still have to photoshop those in) and the round half spheres are to represent the wall masks you have. Overall I would just like your opinion on if you like where everything is placed. I went with three rugs you had chosen in your pdf file you sent over to me. All showing in the floorplan the sizes that the website says are available in them. Also, I show you cabinet painted a dark charcola gray in this. Hi Rachel: Yes, I will try and get you measurements for the art pieces. Was going to try over weekend, but I will see if I can get it done today. Also, Just checking....but will you still be putting together your new art pieces in a pdf for me to add to the final images? Hi: Dining table with 'leaf' in is 2.2m Long x 1m wide. Without leaf (takes from 8 seater down to 6) table is 1.7 long. We mostly seat 6 if guests, so I could take leaf out and reduce to 1.7m. I know what you mean about dining/wine/lounge. Lots of furniture in the middle! If we can, let's work to wine/dining/lounge. See my note below with comment from my son! He prefers wine/dining/lounge so the parents cant listen in to kid talk! Re blue chairs in lounge and burgundy in wine area - I guess I am open. Will depend a bit on the throw rug? I quite like the design in floorplanner, with the bold pattern in muted colours. Does that impact chair colour? I am open to your recommendation. Re dining chairs - I am going to be limited to keeping what I have for now. In future. I could put upholstered chairs at head of table, but for now can leave as is. Also, one final thought: I have explored the idea of knocking out the slider door from the lounge into the kitchen. It is a cavity slider so if it went, it would double the size of the entry between kitchen and lounge. It is not on the budget for the ear future, but would that influence our design choice if it was an option? Rachel: My 12 year old son had one comment on the design. He prefers the wine/dining/lounge format as it separates the 'adults' from the kid space by the tv. The kids, when we have guests, either congregate in his bedroom or in the lounge. Food for thought. A few questions. Did you like the blue chairs I suggested for the lounge area? And keep the magenta chairs for the dining area? Another measurement that would be good for me to have is your dining table? Also, are you wanting me to show in the renderings a different set of dining chairs? Something more formal and upholstered? A muted tone would look good. Sideboard: Looked at the photo. Happy with the idea. Given the kitchen/bathrooms are quite modern, would like to see more modern sideboard concepts? Also, initially, as I won;t have a lot to spend, perhaps we could retask my metal cabinet in the original pics to act as a sideboard? Could add a light and it could become the wine cellar and be placed in the new location for the wine area? (Dining/wine/lounge)! Photos of Art: Hi, I will create a separate pdf with the various art pieces, so I can add in their size so you have a detailed list of what I want to work with. This will take a few days, but will try and sort by next week. I am open to repainting any/all of the frames. 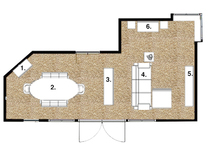 Hi: File just emailed to you with detailed measurements and two layout concepts I have played with: Wine/Dining/Lounge and Dining/Wine/Lounge. Let me know your thoughts. Rugs: See my floorplanner. There is limited choice - but I realise I don;t liek Turkish/traditional design but instead like bold design in more subdued colours. 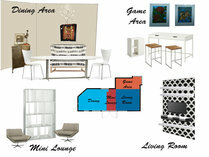 Some ideas on my floorplan to give you an indication, but keep in mind floorplanner very limited. Reading Nook: Ignore this now. If we move to layout Dining/Wine/Lounge, the wine area is there the reading area was. Just like the thought of chairs there to take advantage of the view. Wine or reading = same. Ottomans/Bench vs Chairs/Couch with a Back: I am thinking I want to stick with pieces that have a back to them. I find it hard to sit relax on bench, sit as can't really lean back. So rather than ottoman/bench, can we start by trying furniture pieces with backs. All sounds good. I will get you some "rough draft" layout options and visuals/screenshots, prior to final renderings to look at over the next week or so so that you can get an idea for the space. That way we can go over those and finalize what you prefer. I will look into options for the reading nook space and chaise ideas for it as well. Hopefully you will have internet to check these when you are not working on the road but if not then I look forward to going over everything once you get back! Hi Rachel : Final comments, I promise! Have emailed the decorilla woman the additional pics. I've got to run shortly. Also, I wanted to review your design again for any final comments. Love the mix n mingle space. Warm, inviting, bold and yet funky. Ideally, would want to explore 3 chairs if you can make it work + we need a table for the wine glasses. Love the reading space tucked away. The corner window there gets LOTS of sun, especially winter sun, so we need to think about some kind of chair/chaise in that corner too. (I think Michele proposed a swivel chair - which was interesting). All else good. Love the pop of coluor; love something a bit bold. Can it all work with the curtains?? Thanks. Boping to have email on the road. Hi Rachel: I've taken more photos of the lounge, external facing corner window. I had always envisioned a window seat there (the bookshelves look to be removable) but no one seemed to be able to make the idea work. Not sure if you can work your magic? The cheaper solutuon is to leave the bookshelves and just add a chair. Gets lovely after noon sun. How can I upload the doc with the new photos? Don't see an upload option any more. Hi: The major changes on the measurement was the interior wall where teh yellow chair and lamp are sitting in the photo. I had that way too short. So glad you got the new updated measurements. Re reference to the white - NO! I picked you because of your eye for colour - and the colours you used. The drawing to the white was more around the layout of the lounge - I thought it was interesting to have the couch set that way and out from the wall with a small buffet cabinet behind. That's all. Just letting you know that I got the pictures and new room measurements now. I will be working on a concept including everything you have mentioned in those as well. I looked at the measurements given now and they are the same as previous. Can you see if the new measurements on here are what you just uploaded? I am also not seeing pictures of the fireplace idea from Rinnai that you mentioned. 1. Could you add a picture more close up of the wall/window area on the reading nook walls? 2.You mentioned liking the more white concept, are you wanting me to go a little more neutral, such as changing the rugs I chose, too colorful? And were you saying that you would like a rug under the dining table as well? 3. Do you like the blue poufs around the coffee table still? 4.And Would you like me to still keep the current blue reading chair I chose? An option could be to use two of those in the living space like you mentioned and then choosing two sofas to extend out from fireplace wall. But then you might lose the space for a reading nook next to bookshelf. But that would look really great I think as well. Okay - measurements all uploaded + some pics uploaded to of fireplace ideas. Rinnai here is NZ does a low profile gas fireplace - just expensive! I would need a builder to box it up and it could flue directly to outside. So doable - just beyond this years budget. But I do want to factor it in in case I win Lotto! If you need anything else, I am around tomorrow day and then away,. My ceiling height is 2800m. Now the measurements better, Id love to have you play with some additional layout options. I am not fixed on keeping current couch - bought it used as a stop gap. I do want to explore a gas fireplace on long, solid outer wall. I had envisioned it being rendered in some interesting texture and shelves for art on either side. Not sure if there is a way I can upload pics - I found some from Houzz I had filed a while back. I would like to try two couches extending out from the wall with the fireplace - coffee table and rug in middle plus some added chairs? I would like more lounge seating that what we currently planned for. Love the three chairs idea on wall by kitchen and doing something colourful there. And happy with dining room in middle - on rug? Will set better now I have the right wall measurements there. Hi: Think I might have had too much wine when I originally measured as measuring this time, I think I got a very different result! I've uploaded the screen shots from floorplanner.com. Plus tried to provide some more detail. It is possible, so just let me know what your thoughts are on it. I have no problem waiting. Thank you for choosing my design! I am looking forward to it. I will contact them to see if that is possible but I do not see any problems with that. I am not sure if there are a ton of measurements I still need besides ceiling height and maybe door/window heights. Other than that I know we mentioned moving the fireplace over there and possibly going with different sofas. Was there anything else in the design that you possibly wanted to change? If it is a lot to process before you leave then I have no problems waiting. But in that time I could get a lot of the renderings mostly finalized if I were to still work on it until you came back. Up to you! Just let me know your thoughts! Hi Rachel: Congrats - you've won. My issue is the following: I leave for a work trip on Wed NZ time. I likely do not have time to finalise all the measurements etc before I can. Can we pick this up when i get back in mid June? Hi Rachel. The tv is absolutely not the focus of the lounge. We watch it rarely, so it can definitely blend in. I am Rachel and just wanted to introduce myself. I am looking forward to working on your space and hopefully creating the perfect design for you and your home. My one question right now is...how much do you use your tv? Should there be a designated area for it with all furniture facing it in the living room or would you rather it just blend into the room like art? Hi Eleni: Welcome aboard! The interior sliding door (same side as the wall with the windows and the outward opening french doors - the long wall) does go into the kitchen. The kitchen sits as a square through the doorway. I'm looking forward to see what can be done in it! I just have one question; does the interior door lead to the kitchen? Or, to put it this way, is there a reason why the dining table is on the long area of the room or can it be switched with the living room area? 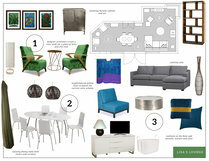 Note: Schematic drawing of lounge area has been re-uploaded to include measurements/dimensions. HI Michelle: Everything is expensive in NZ - the trade off for living in such a beautiful place! Some options: Hunter Furniture (not high, high end but good quality and stylish); Freedom Furniture (more mid to low end). I've never really invested much in my house - so don't shop much. We have a pretty good online option like e-Bay - which is trademe.co.nz and if patient, some pretty fantastic pieces come up on there. So I am happy to be patient and build as dollars allow as pieces come up. Also, I've replaced the schematic of the lounge with a new schematic with measurements. Let me know if anything else you need. Hi Tabitha: Sorry for the delay. Re the table....hmmm...for just my son and I every day meals, we use the small table in the kitchen. When we have guests over, which would be every other weekend, we use the big table. My son and friends use it for homework and I use it for work. Have just uploaded a new photo of lounge with a leaf taken out of the table and the table moved to the angled wall and out of the way. It can seat 6,8 or 10 with 0,1, or 2 leaves. Re style: Is there such a thing as eclectic contemporary?? I love the thought of being eclectic, where it means to me - funky, cool, unique pieces, comfortable, unique, not stuffy. BUt I fear I am not an eclectic person, so it would have to almost be like a paint by numbers for me to 'get it' and do it well. The house itself (kitchen, bathrooms, etc) is more contemporary - so perhaps contemporary with a few unique, eclectice pieces thrown into the mix is more me. 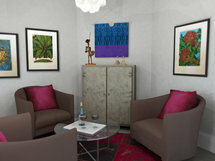 I can definitely work on an eclectic contemporary look for your space. I think it's a good idea to lean toward the contemporary so that this space flows with the rest of the house. But I love the idea of adding a few unique touches to make it eclectic. Great. Maybe we can create a new style called "Comtempeclectic!" My goal when I travel, and I get to travel all over the world for work, is to bring home unique, one off pieces. The art from S Africa, the metal statue on the metal cupboard is from Chile, the hupile (purple shirt) is from Guatemala. I am off to China and London next week - then Vietnam a few weeks after. Will be good to know if any specific pieces I need to look for while traveling. The challenge is always getting big things home, but nothing impossible! This is a great space! It has lots of light and space, even if the layout feels awkward. There is a lot that can be done here so I'm excited to play it out. Is there any places that are in NZ that you do like to shop at. I'd like to save to the hassle of excessive shipping costs if at all possible. Also do we have a general length and width of this space so I can get a better idea of scale? It's possible we may want to rearrange furniture but I want to make sure it would fit. Thank you for uploading your space to Decorilla. I am excited to re-design your space and hopefully create something you and your family will love. How frequently do you use the dining table? Would you rather have an eclectic space or a contemporary space? Thank you for the additional info and clarification on preferred style for this space. I'm Vicki, I'm looking forward to working on a design for you, it is such a lovely home! 1. Open to changing drapes in lounge. I have beautiful, heavy white damask drapes in bedroom that could be swapped if that helps. 2. I've now removed leaf from dining table and moved against angled wall. Table can seat 6, 8 or 10 depending on leaves in. I have 6 chairs. 3. Large African art print - there are two of them - as a pair. 4. I am opening to repainting frames on any of the art as requried. Thanks for your answers and sorry for the error. I've notified the developer!! Hi Christine: Nice to hear from you. Sofa is more taupe-grey. The carpet in lounge is taupe and sofa a deeper intensity of taupe. Yes, lounge has just recessed lights. I am open to any/all lighting ideas. Crawl space above ceiling is easy to access so adding pendant, etc can be easily done. Re curtains - I paid extra for them when I bought the house, but I realise they impact colours/tone of room. I will post a photo of cream damask curtains from bedroom - switching them could be an option. If the current curtains curtail the design and desired result, I am open to new curtain ideas but would not be able to invest a lot of money in proper, expensive drapes. Note: I never close the curtains as back of house quite private and has lovely views. Your space is amazing and you have some gorgeous pieces to work with! Am so excited to hear you're in NZ as we have a designer who while may not be available for your project, can direct us with sourcing ideas! 1. From the photo the sofa has a blue-ish tone, is that right? Or is it more of a charcoal gray? 2. In terms of lighting, are there recessed lights? Would you like a floor lamp or something for reading? A pendant over the dining table? 3. How do you feel about your window treatments? Keep the curtains? I think keeping with the white, once you move onto getting the fireplace wall structured in, is a great move. Tufted Ottoman Flax Discount link available to project holder only 58"w x 28"d x 18"h.
Overarching Floor Lamp Brushed Nickel with Charcoal Shade Discount link available to project holder only 19"diam. x 77"h.